Your dreams can come true! You can watch the New York City Thanksgiving Day Parade without the crowds and without the weather – at this once-in-a-lifetime indoor party overlooking the world-famous parade. You’ll have private access to the Residence Inn Times Square’s 3rd floor Empire Room beginning at 8 am where you can view the parade at balloon height from indoors through windows facing the 6th Avenue parade route. Enjoy a complete brunch buffet including an omelet station, while you’re served Mimosas and Bloody Mary’s, or a selection of beer, wine, coffee, tea and soda. Live video and audio feed of the parade on flat screen monitors will enhance this “bucket list” event. To make it even easier for you, we’ve arranged for your accommodations right at the Residence Inn Times Square in your choice of a one-bed with a pullout sofa or a two-bed suite, each comfortably accommodating 3 adults or 2 adults and 2 children. A full hot breakfast is served daily, and each suite has complimentary high-speed internet. Accommodations are also available at the nearby Courtyard Times Square South (daily breakfast is not included at the Courtyard). Accommodations for 4-nights or longer at the Residence Inn Times Square, right on the Thanksgiving Day parade route and just a half-block from Broadway, arrivals Nov. 22 through Nov. 27. Viewing Party in the hotel’s Empire Room where you can watch the parade pass right at balloon level! Balloon Artist and Face Painter for the kids, too. A true celebration of style, history and location welcomes you to a Parade experience that will be as awe-inspiring as it will be fun! Gotham Hall is located just 2 blocks from Macy’s. After a sumptuous breakfast buffet, just step outside right onto the 6th Avenue sidewalk to watch the balloons, bands and floats pass by you. It’s an experience like no other! And Gotham Hall, a Designated New York City Landmark, is a venue like no other! Built originally as a bank in 1924 and more recently converted to a very upscale banquet facility, it’s been the location for events featuring such dignitaries and celebrities as President Barack Obama, Elton John, Bradley Cooper, Martha Stewart, il Divo, Brittany Spears, Steve Martin and Alicia Keys. In its seven-story gilded ballroom, you’ll feel like a celebrity too as you’re treated to fine food and, right outside the entrance, a fantastic view of the world’s most famous parade! We have a selection of comfortable and well-located accommodations for your Thanksgiving visit to New York City. All are within walking distance of Gotham Hall, Broadway theaters, sightseeing departure points and City landmarks so you don’t have to worry about local transportation during your stay. 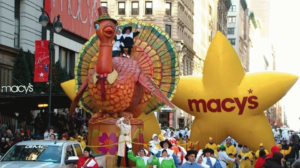 Watch the colorful floats and the spectacular balloons during the 2019 Thanksgiving Day Parade in New York City from an outdoor VIP viewing area! Enjoy an unforgettable Thanksgiving in New York City with a holiday vacation highlighted by our exclusive Insider’s VIP Parade View. After a deluxe breakfast buffet in the New York Hilton starting at 7 am, watch the Thanksgiving Day Parade from an outdoor viewing area. The New York Hilton Midtown is right on the parade route, so make sure to bring your cameras! You’ll also have in-and-out privileges during the parade so you can keep warm and have a bite to eat or a hot beverage! Note: There is no view of 6th Avenue or the parade from the breakfast venue inside the New York Hilton Midtown Hotel. This exclusive event is only available when booked with us and our Travel Partner. You can watch the Thanksgiving Day Parade without the crowds and without the weather – at this once-in-a-lifetime luxurious private indoor venue overlooking the world-famous parade! Enjoy a breakfast buffet in a private dining area on the 7th floor of the Museum of Arts & Design, hosted by the modern classic Columbus Circle restaurant Robert. The event begins at 8 am and includes a premium open bar – then watch as the parade comes straight at you down Central Park West and around Columbus Circle. The windows provide a view of this legendary parade, but you’re also welcome to go outside and view it from the sidewalk*. This unique indoor-outdoor experience will certainly be the highlight of your holiday! Since this exquisite view scans directly up Central Park West, you’ll be able to watch the entire parade come directly at you before it makes it’s way around Columbus Circle, right below! Watch through the windows from the 7th floor, or take the elevators down to street level to hear the bands, see the huge balloons or just take in the most famous parade in the world. You’ll have complete access to the food and drink during the parade – and if you’d like, you can watch it on the large screen TV in our private dining area. New York City’s Avenue of the Americas! Enjoy a deluxe breakfast buffet in elegant Del Frisco’s Steak House, surrounded on three sides by floor-to-ceiling windows fronting the parade route. You can relax in climate-controlled comfort at street-level or balcony-level tables, or stand at the expansive indoor balcony railing to watch crowd favorites like Garfield, Ronald McDonald, Snoopy, Shrek or Spider-Man as they wend their way down the 2019 parade route. Wide screen TVs, face painters, balloon artists – it’s a fantastic “Bucket List” party for the whole family! The view – that’s why this party is such a hit, and sells out so quickly every year. Watch as the parade passes right by – while you’re inside, out of any inclement weather with lots of food, drink and entertainment! Tables are available on the street level or on the balcony level. You can watch the parade from your street level table or at the balcony railing. There’s plenty of space to enjoy the balloons, floats and festivities that make this the most famous parade in the world! Add-ons to Make Your Thanksgiving Holiday in New York City Complete! Holiday Lights Motor coach Tour: Everyone wants to see all the new attractions, trees and lights in New York, but covering the four square miles or so that they encompass in one night and on foot can take a while, not to mention the crowds and weather. 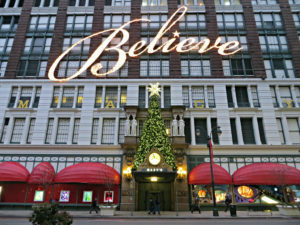 On this guided and narrated tour you’ll visit the City’s famous department store displays and holiday decorations. Daily at 6:30 pm November. 22-December 30. Private or Shared transportation from the three New York Area Hotels. Wednesday tour from midtown to the Macy’s Parade Balloon Staging area where guests will be able to roam at their leisure. The color, the pageantry and the lights of Christmas in New York City. You’ll see it all on this deluxe motor coach tour hosted by a licensed Tour Guide that will surely be the highlight of your Christmas vacation in the Big Apple.